In April 2001 I was lucky enough to take a World War I Battlefield tour of northern France and Belgium that concentrated on the battles fought by the Australian Imperial Forces from 1916 - 1918. 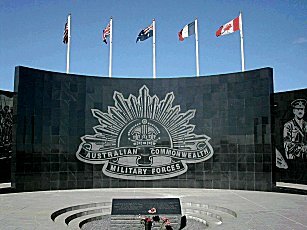 There are currently many tours of the Battlefields but few focus on the contribution of the Australian Forces. There are tours organised by the Australian War Memorial and also the Returned Soldiers League but we wanted something more personal. After much searching we found exactly what we were looking for. Battlefield Tours Ltd operated by Colin and Lisa Gillard is a small company offering personalised tours. We arranged and booked this through French Travel Connection in Sydney Australia. Colin's tours operate from Martinpuich in the heart of the Somme Battlefields. As well as the Somme Battlefields we also decided to take the option of visiting the Ypres Battlefields, further north in Belgium. Our tour was to start in the northern French town of Amiens. We travelled to Amiens from Paris by rail, the trip taking about an hour. Upon arrival at Amiens station we were greeted by Colin who discussed our preferences and then set off. Our first stop was Adelaide cemetery outside Villers-Bretonneux. 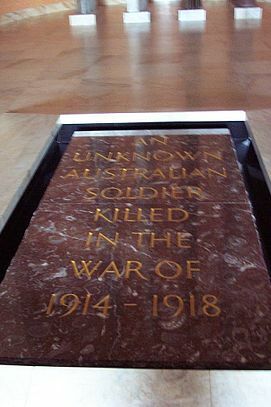 It was from here that an unknown Australian solider was exhumed and relocated to the tomb of the Unknown Soldier in the Australian War Memorial in Canberra. Unfortunately the weather was cold and wet but it didn't prevent us from visiting the cemeteries. Adelaide cemetery is typical of the cemeteries that dot the landscape. It is a very sobering experience to look at the headstones and how peaceful they appear today to the carnage that must have been endured during the fighting. 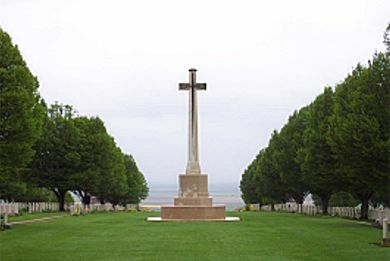 Every Commonwealth cemetery has a Cross of Sacrifice standing somewhere within the grounds. At the entrance to most of the cemeteries are books of remembrance where visitors can write their comments. Each cemetery that we visited was kept in pristine condition, beautifully manicured and cared for. Congratulations must go to the people that do this, it is a fitting memory to those whose final resting place is now here. From Adelaide we proceeded into Villers-Bretonneux or "VB" as it known. Our first stop here was outside the Victoria school. On the wall of the school is the following plaque. It is stirring to see the exploits of Australian soldiers remembered so fondly all these years ago in a place so far from their homeland. 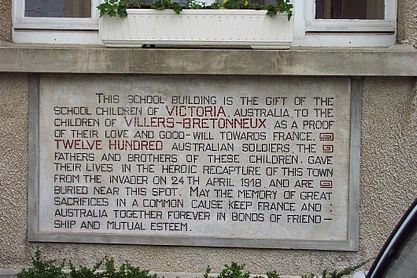 The bond between Australia and the town of Villers-Bretonneux goes much deeper, as we were about to discover. Inside the hall, on the ground floor, of the school you will find a number of carvings of animals. Remarkably, all these carvings are of Australian animals such as koalas and kangaroos. Above the hall, on the first floor of the school is the Anzac museum which contains many interesting exhibits. As you enter the museum you can look out a window into the school yard and be greeted by the following sight. To see something like this, so far from home can't help being able to appreciate the major impact that Australian troops must have had to the town. Even after all these years, children at the school still sing Australian songs every day and continue to learn about the exploits of the men who came half way across the world to defend their town. As you can see the museum stretches the length of the building and contains some fascinating exhibits, with the focus very much on Australia. Once again our guide, Colin, was able to point out significant facts and details that we have been unaware of. A good example of this is the above figure of an Australian solider bayoneting a German eagle. 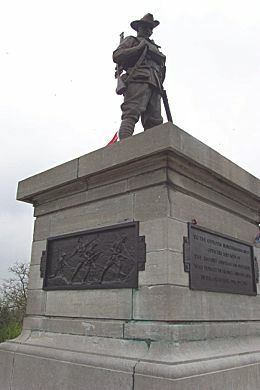 This figure was atop the Australian 2nd Division memorial at Mont St Quentin, which we were to see later on, until it was removed by Germans during the Second World War. Obviously offended by the depiction of German defeat it was removed and never seen again. The museum also has an extensive array of books and souvenirs that can be purchased. A small donation is recommended by way of an entrance fee into the museum of which we were more than happy to pay. From here we set out to the Australian National Memorial a few kilometres north of the town. 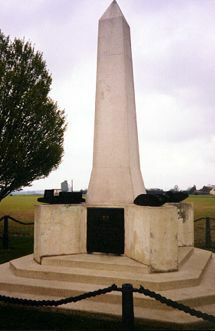 The memorial lies at the rear of another Commonwealth cemetery. Here Australian and French flags fly perpetually in honour of those that were killed. Perched on a hill overlooking the surrounding landscape the Memorial provides excellent views of the battlefield in which Australian fought in 1918. 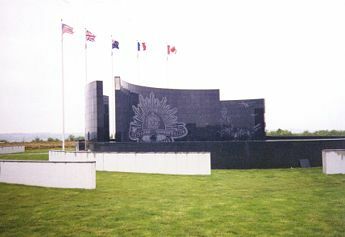 The wall of the Memorial contains the names of 10.982 Australian soldiers who died in France and have no known grave. Unfortunately, the Memorial tower was closed during our visit but is open at certain times of the year. It is also apparently possible to obtain an access key from the curator of the nearby cemetery. Upon closer inspection of the central tower one can see a number of bullet holes. Colin informed us that, contrary to popular opinion, these holes were made by a German Messerschmitt. Apparently, during the German invasion of northern France in World War II the French used the tower as an observation post. As we left the Memorial and the cemetery we once again passed the Cross of Sacrifice that was to become an all too familiar site during our visit. Our next destination was the Australian Corps Memorial Park at Le Hamel . The Park is located on the final objectives of an attack conducted by Australian troops on the 4th of July 1918. The success of the attack was attributed to the detailed planning and tactics of Australian General John Monash. His use of combined infantry and armour, aided by new supply tactics ( from the air ), may be considered standard today but back then they were revolutionary. 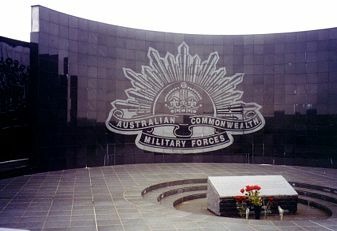 The Australian Corps Memorial Park contains a number of plaques detailing the exploits of the Australian troops that fought here. Colin warned us not to expect too much from the park and he was right ! When we arrived we found that many of the displays and plaques had been damaged from vandalism and the environment. Many of them proved almost impossible to read. The whole Park somehow seems out of place with other memorials around the country side. At the centre of the Park is an open field of wheat. Following the path around this you come to the screen monument shown in the above picture. Made of black slate it depicts the rising sun military badge as well as a portrait of John Monash and some of the weapons of the attack. It was not possible to go up close to the screen wall because the monument was roped off. Upon closer inspection we could see that many of the black marble tiles from the Memorial had fallen off or were falling off. Colin pointed out the unsuitability of this type of memorial for this location. Not only was it "out of place" with other memorial it also used materials that were unsuitable for the temperature extremes of northern France. It was very very disappointing to see something that was suppose to commemorate one of Australia's most successful military operations of the War being such poor condition. 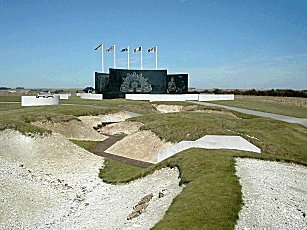 The whole Australian Corps Memorial Park is in need of major renovation to bring it more in line with surrounding memorials and to be a fitting tribute to the men of the Australian Corps, much like the memorial at Vimy Ridge is for Canadians. ( * I have been assured by Nicolas Goret who has his own web site about Hamel at http://www.chez.com/hamel1418/start.html that things have been fixed up since my visit ). Trench lines at the Australian Corps Memorial Park. Past the screen lies the remains of the trenches that Australian fought for and won on that 4th of July. Looking at the country side it is amazing how flat it is. I thought that the strategic areas would have been higher, however I suppose back at the time of War any sort of height advantage could mean a lot. Occupying strategic height locations mean that you could see a great distance and as such could much more easily harass your enemy with artillery. Our next stop was the 2nd Division memorial at Mont St Quentin, however on the way we passed through Peronne. In Peronne is the renown museum Historical de la Grand Guerre having extensive exhibits on many facets of the Great War. Colin gave us the option to have a look but warned that to do the museum justice you would have to spend at least half a day. Regretfully we chose to give the museum a miss this time to ensure that we could visit all the remaining Australian places of interest on the battlefields. This 2nd Division memorial is very different from the other Australian Divisional memorials. Initially it featured a large statue of an Australian soldier bayoneting a German eagle. However, during the Second World War it was removed and never seen of again. In 1971 it was finally replaced with the bronze statue of an Australian soldier that we see here today. After this it was time to head back to Colin's bed and breakfast at Martinpuich and settle in for the night. Colin and his wife Lisa own a small farmhouse in the town in which they are able to accommodate small touring parties like ourselves. We found large rooms, with two or more beds, bathroom, tv, video and more. After unpacking, joined Colin and Lisa in the main house for a pre-dinner drink. Colin has a very extensive library of books and videos that you can borrow during your stay to provide you with more background on the events surrounding all the battles of the period. After our drinks Lisa took us down to the local restaurant, just outside Bapaume for dinner. In this part of France not many people speak English. Luckily Lisa stayed with us to help us get our orders straight. It is a strange experience sitting in a restaurant so far from Australia ordering everything in French. After an excellent meal we let the owner know to give Lisa a call to come and pick us up. After a short drive we returned to the farmhouse and settled in for the night. Our destination for the following day would be Ypres in Belgium. After a very restful night we joined Colin and Lisa for breakfast in the main house. Since we were a little late rising on this morning we decided to take a short walk down to the centre of town and make a phone call back home. The weather was still very cold, made especially so by the strong wind that was blowing. We started off on our trip to Ypres in Belgium to take in all the points of interest there. Our first stop was just outside Fromelles to see the VC Corner Cemetery and the Australian Memorial Park, better known as Cobbers. In 1916, the Australian 5th Division, along with the British 61st Division, were tasked to attack the German strong point outside Fromelles. Once again the general area of the battle now gives you no indication of the violence that once took place here. Just before the "Cobbers" memorial is the only all-Australian Cemetery of the area, known as VC Corner. Another unique thing about the cemetery is the fact that there aren't any gravestones. The unidentified bodies of 410 are buried in the lawns, each marked by a rose bush. The cemetery was situation in no-man's land between the Australian and German lines in 1916. The screen wall at the back of the cemetery at the rear are the names of 1,299 Australians who dies in the battle and have no known grave. A few hundred metres further along is the Australian Memorial Park with the "Cobbers" statue.
" In this brief action the British suffered 1,547 casualties, the Australians a devastating 5,333. It was the only time in France that the Australians failed to take their military objective." The "Cobbers" memorial here is unique in that it honours the many individuals whose selfless acts saved many of their mates from death. In what is now a peaceful field Colin gave us a complete run down of the battle and pointed out all the relevant locations nearby where events transpired. We now continued north toward Ypres stopping firstly at the Canadian National Memorial at Vimy Ridge. Monument at Canadian Memorial Vimy Ridge. 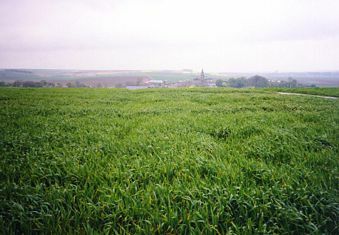 It was here in 1917 that the Canadian captured a strategically important ridge that over looks the plain towards Lille. 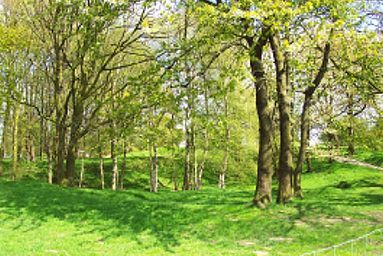 At the southern end of the park you will find the remains of the trenches. It is still possible to take tours of the extensive tunnel systems that still remain, however we were running on a tight schedule so we had to give it a miss - unfortunately. Further north, on what was Hill 145 the highest point of the Vimy ridge line stands the Memorial. At day break on April 9, 1917, all four divisions of the Canadian Corps, fighting together for the first time attacked the German positions on the ridge. Assisted by good planning and artillery support, the Canadian continued to advance and by mid-morning had taken the whole ridge except Hill 145. It would take then another three days before they would capture it. The action cost the Canadians 10,602 casualties of which 3,598 died. The Vimy Ridge Park now stands as memorial to all those Canadians who died or risked their lives to fight for the Allies in the First World War. The monument was designed by Canadian sculptor and architect Walter Seymour Allward and took over 11 years to build. It sits on 11,000 tonnes of reinforced concrete. 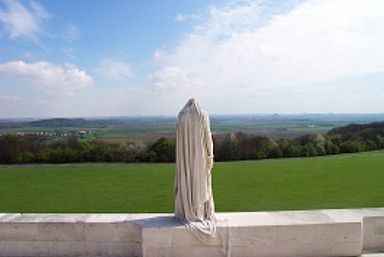 A cloaked figure stands at the front facing east over looking the Douai Plain. It was carved from a single 30 tonne block. 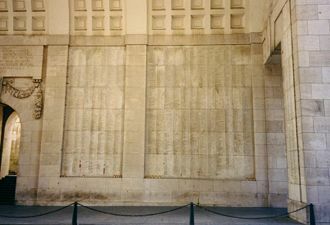 On either side of the front walls at the base of the steps are the Defenders : two groupings of figures known as the Breaking of the Sword and Sympathy for the Helpless. Carved on the walls of the monument are the names of 11,285 Canadians who where killed in France and whose resting place is unknown. Altogether 66,655 Canadians died in the First World War. The twin white pylons, one bearing the maple leaves of Canada, the other the Fleurde-lis of France, symbolize the sacrifices of both countries. At the top figures representing Peace and Justice, with Truth, Knowledge, Gallantry and Sympathy below them. Around these figures are shields of Canada, Britain and France. Large crosses adorn the outside of the pylons. In the centre, at the base of the pylons, a dying soldier, the Spirit of Sacrifice, throws the torch to his comrades. Two other mourners, a man and woman recline on each side of the steps on the western side. Today Vimy Ridge is seen much the same way that Australians see Gallipoli. It is probably the most striking memorial that we saw during our trip. 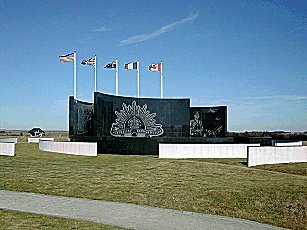 When you compare this memorial to the one at le Hamel, when all Australian Divisions fought together, we should hang our heads in shame. There is no more fitting and striking national memorial in the region that better serves to honour those who gave their lives and stir the emotions of all those that visit. No matter what nationality you are a visit to Vimy Ridge is very worthwhile. We now continued to the Messines ridge, scene of Australian activity in June 1917. A bulge ( or salient ) had developed south of Ypres that needed to be removed before actions around Ypres could be continued. During the preceding months a total of 21 huge underground mines had been constructed under German trench lines. At 3.10am on 7th June 1917, they were all detonated simultaneously. The result on the front line German troops was devastating and Australian, New Zealand and British troops were easily able to achieve their objectives. The town of Messines, in the south of the salient, was actually captured by the New Zealand Division that was then attached to II Anzac Corps. On the outskirts of the town is the New Zealand Memorial Park, from here you get excellent views of the direction of attack for II Anzac. The small park also has the remains of a few German blockhouses, seen for the first time by the Anzacs. A short distance from Messines is Spanbroekmolen Crater, which was the larges of all the mines detonated on that June 7 attack. It blew a hole 129 metres in diametre and 27 metres deep. 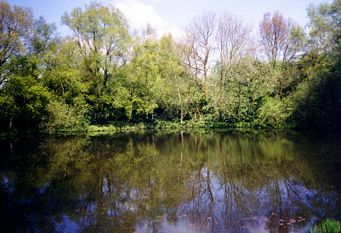 The crater has since filled with water and is now known as the "Pool of Peace". Lone Tree Crater now known as "Pool of Peace"
Further north is Hill 60 and the memorial for the Australian Tunnelling Company. The Australian 1st Tunnelling company became responsible to keep in tact the mines that had been laid under Hill 60 at Ypres. Much of this protection involved fighting underground. From Hill 60 we now proceeded into Ypres. After seeing many pictures of Ypres in rubble it is difficult to imagine what it must have been like for the Australian troops as they came up through the town and out onto the battlefield. We stopped at the town square and took a moment to look at the Great Cloth Hall. There is apparently an excellent museum ( In Flanders Fields ) within the Cloth Hall, that requires about half a day's attention, unfortunately we decided to forgo this for other sights today. 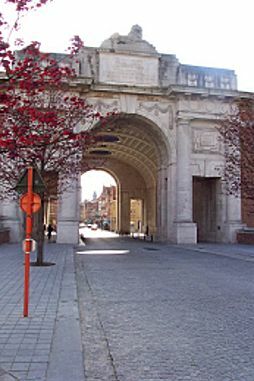 A short walk from the square is the famous Menin Gate. The Menin Gate did not exist at the time of the War but stands as a tribute to all those that passed by on their way to the battlefield, never to return. One of the most haunting paintings that I have seen hangs in the War Memorial and Canberra and shows the Menin Gate at night with all the ghostly soldier figures still proceeding out onto the battlefield. To be actually standing at the Gate after seeing that painting is something quite unique. On the inside of the Menin Gate are the names of about 55,000 soldiers who have no known grave, of these about 6,200 are Australians. On either side of Gate are ramparts that you can access from inside the Gate. During the War many soldiers actually slept here before proceeding out into battle. You can stroll around the ramparts that provide, excellent views of the town and surrounding area. Every night at sunset the local fire brigade attend the Gate and play the Last Post as a mark of respect for those that died. Unfortunately our schedule didn't allow us to attend, however I have read that it can be a very moving ceremony. As we strolled back from the Gate we stopped at one of the many chocolate shops that lined the road for some indulgence in the world renown fine Belgian product. Back in car, we proceeded through Ypres and out onto the flats that face the town. As we headed towards Tyne Cot cemetery we passed what was known back during the war as "Hellfire corner". Since this point was flat and exposed to observation the Germans were able to accurately sight their guns on it so that when traffic passed it attracted heavy and extremely accurate fire. All passing traffic had to run the gauntlet to pass in or out of Ypres on the Menin Road. These days there isn't much remarkable about the spot, except being a large round about. Our next stop was the largest Commonwealth cemetery on the Western Front - Tyne Cot. This cemetery has 11,956 graves and covers an area of 35,103 square metres. 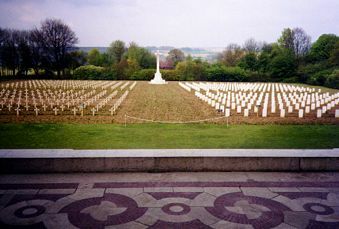 It also contains 8,366 graves of unknown soldiers. 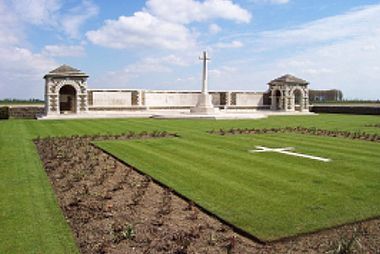 Over 1,368 Australian servicemen are buried here in the largest Commonwealth cemetery of the War. 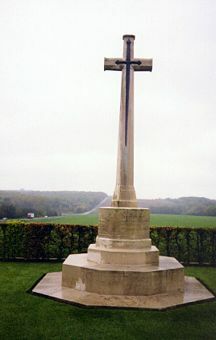 In the centre of the cemetery is the usual cross of sacrifice, however this time it sits atop a German blockhouse that was captured by Australian 3rd Division on October 4, 1917. Being the largest of all Commonwealth cemeteries it is not surprising to find a great many more tourists here. As with all Commonwealth cemeteries it is immaculately kept. Colin was once again able to point out some interesting facts about the cemetery and how it grew in importance over the period. Towards the front of the cemetery you will find the remains of other German blockhouses and just behind one of these you will find the grave of Captain C. S. Jeffries who won the highest Australian commendation, the Victoria Cross. One of the most remarkable features about my whole study of the Australian involvement in the war are the remarkable feats of bravery performed by "ordinary" Australians. The story of most Victoria Cross winners are inspiring and I commend to you further study of the ones awarded during the War. So far our trip had really only covered Allied cemeteries and memorials, I had not seen any German ones at all. I asked Colin and he said that since the Germans were the defeated power and considered an "invading force" their memorials are not nearly as many or as grand as those of the allies. To demonstrate this fact to us he took us to Langemark, a German cemetery not far from Tyne Cot. 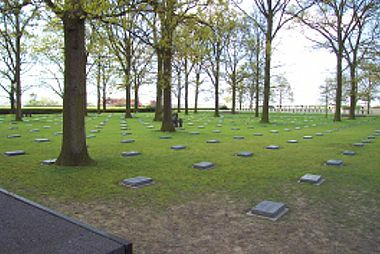 Mass grave that is now a rose garden at Langemark. In contrast to the throng of people at Tyne Cot, when we arrived at Langemark there was no one. This place is very, very different from any other cemetery we visited during our whole tour. The place has a much darker and sombre mood about it and feels very cold and lonely. Upon entering, the first thing that catches your attention are four silhouetted figures at the rear of the cemetery. Seeing these figures in the distance and the fields beyond is a very creepy feeling and creates a very dramatic effect. The next most noticeable feature is the huge rose garden just in front of the entrance. Colin told us that this garden was actually a massed grave that held between twenty and thirty thousand German soldiers. After many battles German forces were not given much time to bury their dead so mass graves became the order of the day. The remaining layout of the cemetery, as you can see from the above image, is just equally spaced grave markers. On closer inspection of these grave markers you may find up to eight men buried in a grave, a stark contrast to all the previous Allied Cemeteries that we saw. From here we now proceeded back to Colin's bed and breakfast in Martinpuich. 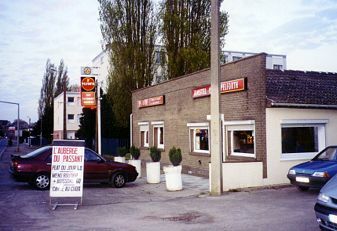 After a couple of hours on the road we once again dined at the same local restaurant we ate at the previous night. After this we once again returned to Colin's cottage to settle in for our last night in the battlefields of the Somme. The final day of our tour once again started with a hearty breakfast in Colin's kitchen. 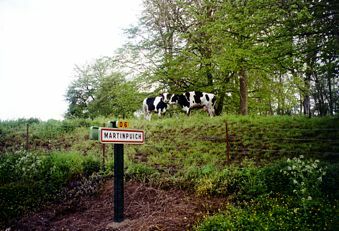 Our final half day would be mainly composed of sites locally around Martinpuich. We thus set out for the village of Pozières. Our first stop was just outside the village at the Australian 1st Division memorial. Just across the road from the memorial are the remains of Gibraltar, a German blockhouse that commanded sweeping views of advancing troops, until it was captured by soldiers of the Australian 1st Division's 2nd Battalion on 23 July, 1916. The remains of the blockhouse are in disrepair but Colin told us that there are moves to restore and preserve the location. From a viewing platform you get an excellent view of the country side as well as the Australian 1st Division memorial. Just past the town of Pozières, on the side of the road lies the Windmill site. Colin told that the cost to take this small piece of ground was over 6,000 Australian lives in a period of about twenty four hours. As I walked to the top of the small mound where the windmill once stood and gazed out over the now peaceful French countryside it is hard to imagine what it must have looked like back then. Comprehending the lost of life is also staggering, it would like asking 6,000 people to stand in the fields and all fall down at once. 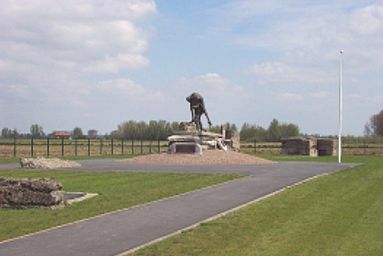 Just across the road from the Windmill site is the British Tank Memorial that commemorates the first use of armoured fighting vehicles by British forces in the region. At the base of the pillar of the memorial you will find replicas of four different types of British tanks used during the time. Just north of Pozières is Mouquet Farm, the scene for some epic battles by Australian forces towards the end of their time in Pozières. There is not a lot to see here but the location is marked by a battle plaque. In the distance you can see the location of the farm built after the War. Colin pointed out the location of the original farm as well as the location of the major encounters between Australian and German troops as well as the German strong points that proved impossible for the Australians to overcome. Although the Australians lost many lives trying to take the position it proved to too strong and dogged all resisted Australian attempts to take it. From here, we proceeded to the objective of the Pozières attacks - Thiepval. Perched atop a strategic hill, the British memorial at Thiepval can be seen for miles around. It is the World's largest war memorial with the names of 72,085 British and South African troops missing in action or with no known grave. 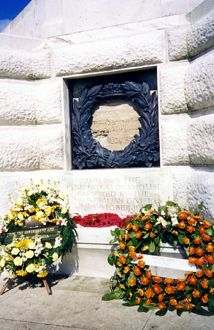 At the back of the memorial is a cemetery in which lay an equal number of unknown British and French soldiers. It serves as a reminder of the alliance between these two nations and the men from both countries that gave their lives to the cause. No far from Thiepval is another unique memorial to Allied fighting men. The Ulster Memorial is once again a very unique structure on the battlefields. The Ulster Tower is a tribute to all the Ulstermen who died in this location and elsewhere on the Western Front. The tower is an exact copy of the tower that is located on the grounds of Clandeboyne, County Down where the 36th trained before arriving on the Western Front. The original tower in County Down was a memorial to Helen, mother of the Marquis of Dufferin, located in the family park. Every day, except Mondays, the tower is open for inspection and contains some interesting exhibits. Unfortunately, being Monday we had to miss out on what Colin assured us was a very worthwhile site. The last town we visited was Albert, where the famous fallen Madonna was situated. During an initial attack, early in the war, the statue of the Madonna on the church spire was left hanging parallel to the ground, but still attached to the spire. There it remained perched for months. Many believed that when the Madonna did finally fall the war would end. Unfortunately it did fall, but a few months before the actual end of the war. Today the Madonna statue has been restored to its erect position above the church spire. Albert is a very pretty town and has many memorials to battles found in its vicinity. It also has a very good museum that, unfortunately, was flooded during our visit. Colin once again pointed many interesting features of the town that would have gone unseen to the average visitor. We were now nearing the end of our tour and started back towards Amiens, where we would catch a train to return us to Paris. On the way Colin stopped by the side of the road to show us examples of the military hardware that farmers in the region still recover when they plough their fields. Local farmers collect shells, like those in these images, and leave them on the side of the road for the French military to take and dispose of. The problem is that much of this ordnance remains unexploded and potentially unstable. Unsuspecting ( or STUPID in my books ) tourists actually take these items home as souvenirs ! Knowing the potential results of unstable ammunition we were more than happy to leave all these items to the French military for proper disposal. After what seemed like such time we were once again back at Amiens station awaiting another train trip. We thanked Colin very much for all his time and hospitality and bid him farewell as he went looking for his next tour party. We had seen so much in just a few days and it had left an indelible mark upon us all.